Aftelier Perfumes recently launched Face & Body Balms that are a remarkable treat for the skin and the senses. They are thoroughly non-greasy and they effortlessly melt into the skin when met by its warmth. They deeply moisturize the skin and leave it soft, supple, smooth and nourished. Furthermore, they are available in two otherworldly aromas: Frankincense and Rose, and both are a delight to use. I researched balms for a long time, and developed a Rose balm with a blend of Turkish rose absolute and Bulgarian rose wax, in a base of squalene oil & sea buckthorn berry oil. For my Frankincense balm, I wanted to harness the wondrous healing qualities of the boswellic acids that are lost when distilled into an essential oil, so I have extracted the resin myself to use in this balm. Aftelier Perfumes Frankincense Face & Body Balm ($35.00 for 15ml. from Aftelier Perfumes): This unique balm is unlike anything that I have ever tried before, and its healing and soothing abilities are truly unparalleled. 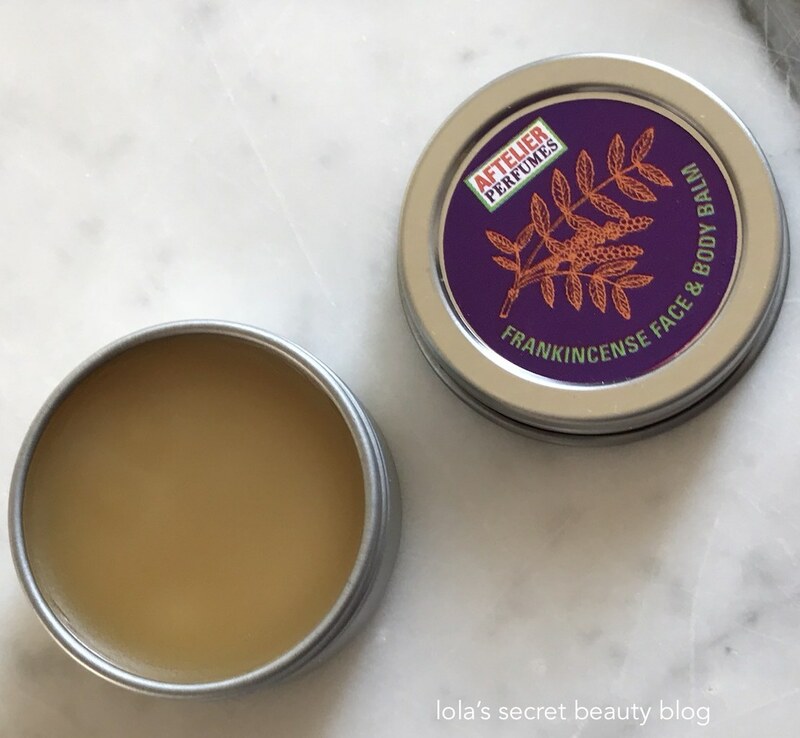 Made from two types of frankincense, this anti-inflammatory balm heals irritated, sensitive skin, reduces inflammation and redness, and deeply nourishes and moisturizes the skin. One does not need to dig their fingers into the balm, but instead simply rub a clean finger across the top of the balm and the perfect amount of this emollient gem coats the fingers and spreads across the skin. It is thoroughly non-greasy and immediately sinks into the skin leaving it soft, smooth, supple, hydrated and soothed. It has the delectable, warm and earthy aroma of the highest quality frankincense that calms and nourishes he skin, relaxes the body and calms the mind. This balm is nothing short of remarkable! This calming, anti-inflammatory healing balm is non-greasy and absorbs quickly. Made from two kinds of whole frankincense oleoresin (not the essential oil), boswellia neglecta and sacra -- extracted by me; both are rich with boswellic acids that are so supportive to health. These two varieties of frankincense are blended together to create a beautiful relaxing aroma. Includes organic beeswax and frankincense CO2 extract. Rejuvenating Frankincense Face & Body Balm offers deep hydration and long lasting moisture, giving you with smooth and supple skin and a sense of well-being. 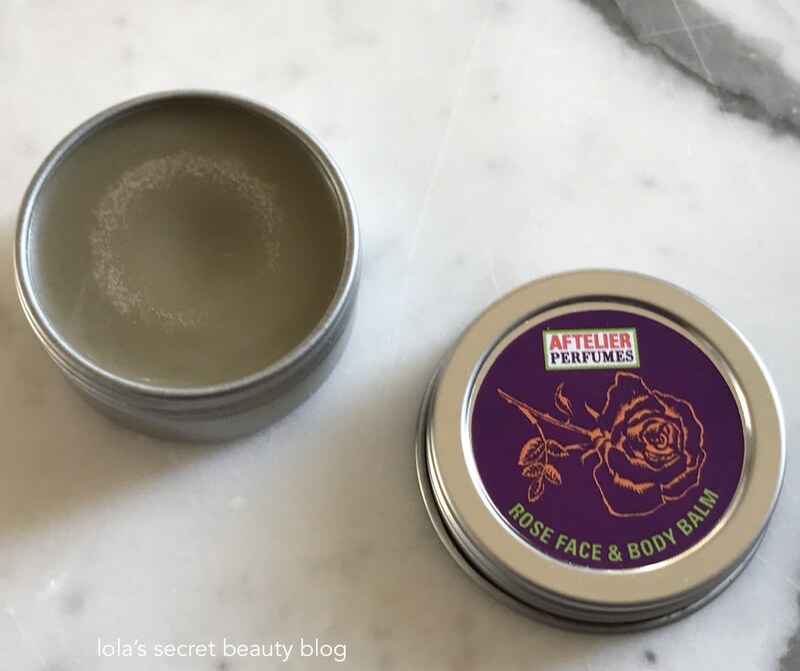 Aftelier Perfumes Rose Face & Body Balm ($35.00 for 15ml. from Aftelier Perfumes): This rose is the rose against which all other roses should be judged forevermore! It is lightweight, fast absorbing, ultra-emollient, without being in the least bit greasy, and it is a deeply nourishing antioxidant-rich and anti-inflammatory moisturizer. It melts into the skin beautifully and leaves it soft, smooth, hydrated, calmed and luminous. The aroma, which is a hypnotically enticing rich and ethereal rose, is intoxicatingly beautiful and addictive. In fact, I often open the tin to simply smell it because it is such a delight to the senses. This uplifting and healing balm, made with Turkish rose absolute and Bulgarian rose wax, imparts a veil of mesmerizing rose aroma as it melts into your skin. Rose is known to be emollient, moisturizing, and anti-inflammatory. 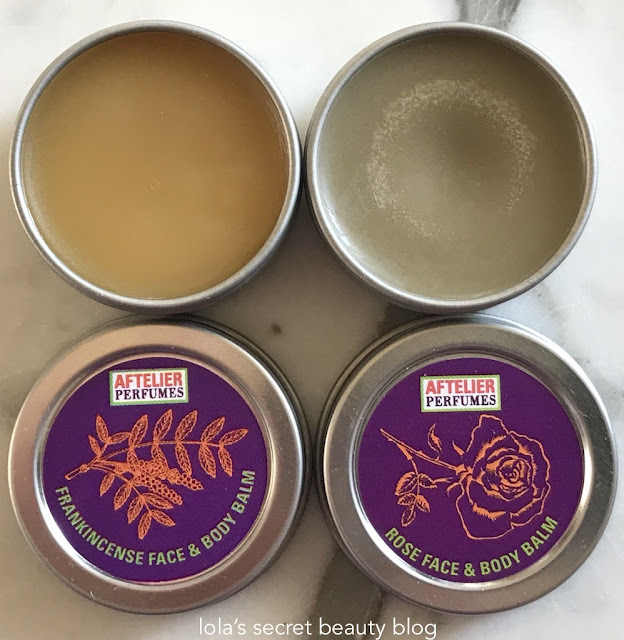 Rose Face & Body Balm includes the powerful anti-oxidant squalane (from sugar cane) -- which helps the skin's healthy cellular growth and its ability to retain moisture, and vitamin-rich and nourishing sea buckthorn oil -- known to promote regeneration of skin cells. Overall Assessment: These are both exceptional face and body balms, and as one might imagine they are truly obsession-worthy handcrafted atelier creations from master natural perfumer, Mandy Aftel. Both earn an unmitigated A+, and I highly recommend trying them. $35.00 each for 15 ml. 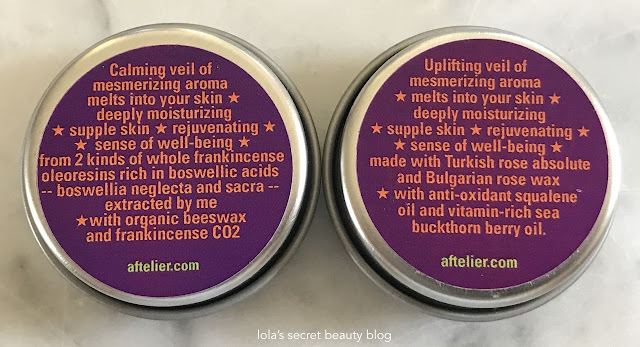 tins from Aftelier Perfumes (Unaffiliated Links). What a cool product! I have a number of solid perfumes that I like, but they come in tiny pots. I also have a few balms that I should use more often. But the balms are either unscented or an herbal scent that I don't love. This is a wonderful idea! These balms are truly amazing, and I think that you would really love hem a lot, Allison! Oh wow I bet I would love those scents! I think that you really would, Jen! Is the fragrance too strong? I like face balms! Definitely not too strong, Kath! The Frankincense is pretty subtle, and the rose is a bi more assertive, but it's definitely not too much! I love body balms especially in the winter. These sound like wonderful scents. Me too, and these are especially wonderful, and they can be used on the face and body! What an interesting product I like the sound of the frankincense. They are really wonderful balms, and their aromas are truly exceptional. The frankincense is very earthy and warm, but not in the least bit imposing!